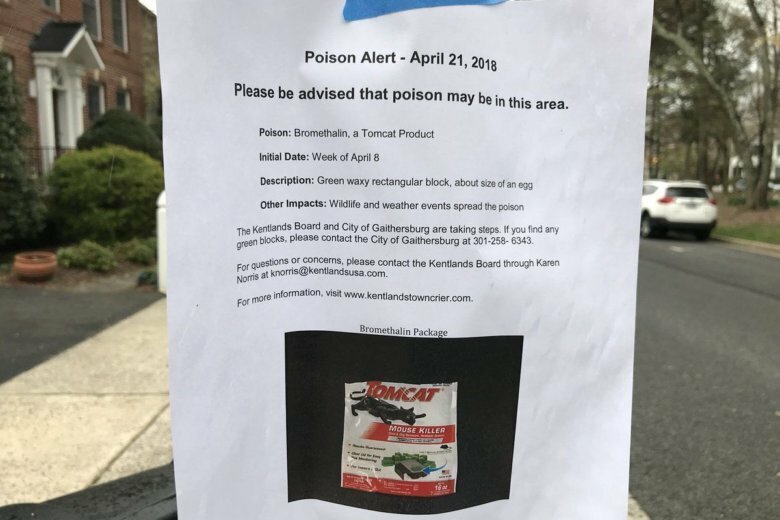 After a homeowner in the Kentlands neighborhood of Gaithersburg, Maryland, misused rodent poison on his property, it ended up in the yards of at least 16 neighbors and a common wooded area. “The resident who put them out at first told us there were 16 pieces, which is about a pound. Then, he said 32. And now, we’re up to 60, so we’re hoping that 64 is the total number that are out there, but we really don’t have a straight answer. And now, we are told that it was spread out over a period of six weeks,” Harris said. It looks like squirrels and other small animals carried chunks of the poison into other yards and, in some cases, buried it under mulch. The Kentlands Citizens Assembly, which is the homeowners association, said neighbors even found the poison high in a tree, 18 feet above the ground. According to the association’s update on the situation, most of the poison has been found on properties and woods within the area of Tschiffely Square Road, Leekes Lot Way, Treehaven Street and Lake Helene. Just three chunks of poison were found outside that area. The search for poison will continue until no more is found. “We’re still looking, but at this point, we’re not finding more than one or so per day, so we think we’re very close to the end; we hope we’re very close to the end,” Harris said. Signs remain posted in the neighborhood to inform people of the situation, and residents and visitors are being asked to keep an eye on children and pets, and avoid walking dogs in the affected area. Three dogs in the neighborhood recently became sick. Two were treated as if they had ingested the poison, and they recovered. A third dog got sick before the problem with the poison was reported. That dog died, and there’s no way to determine if the poison played a role. Anyone who finds what they think may be more poison is asked to call the Kentlands management office, and if they like, place the piece in a plastic bag and bring it to the office. The homeowner at the center of the issue has been cited and fined by the city, and although police have spoken with him, no criminal charges are expected. Harris would like to see Maryland place new limits on sales of this type of poison.